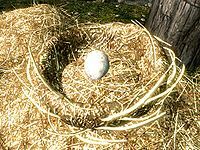 Chicken's Eggs can be harvested from Chickens' Nests which are found at most farms. The nests are usually in a little shed-like structure, but not always: nests can be just outside on the ground. They cannot be harvested from other birds' nests—those nests yield pine thrush eggs and rock warbler eggs. They are one of only three ingredients with a Waterbreathing effect. With the Hearthfire add-on installed, there are two more additional items with this effect, giving a total of five ingredients with this effect. Chicken's eggs are also categorized as food, meaning they can be sold to innkeepers as well as apothecary merchants.